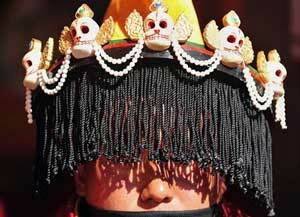 The domra is a unique type of head or facial ornament, brought to Tibet by the great master of Shijé, Padampa Sangye. The origin of its name remains vague, and no informant has yet been able to verify the roots of the term. The tomra consists of a short visor, not unlike one a poker player or sunbather might wear, jutting out 4 to 6 inches from the forehead. 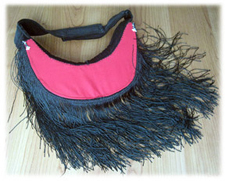 It is made of black felt with a black or red underside, from which are vertical black ropes or strings hang freely. About 6 inches in length, these are traditionally made of yak hair, though nowadays cotton, silk or polycotton strings are more likely. This arrangement allows the practitioner to see clearly through this screen, but his/her eyes are obstructed to the outside viewer. The purpose of this unusual apparatus is simple: to shield the timid and frightened spirits from the brilliance of the practitioners powerful gaze. The energy streaming from the eyes of an individual who has some Chod experience or realization can indeed be overwhelming and overpowering for lower spirits, even though they are themselves noxious and frightening harm-doers. It is thus out of compassion that one wears the domra, to allow all lower guests to partake of the red feast. The domra is in standard use by certain lineages of Chod practitioners, while others disregard it completely. It appears to be most popular among followers of the lineage of Padampa Sangye, such as Lama Wangdu Rinpoche, as well as Nyingtik practitioners, and is much more likely to be seen on solo practitioners and wandering yogis than in group practice that occurs in the larger monastic assemblies. It can also be worn during any peaceful domra offering (such as a kartor), where one does not wish to appear threatening to local spirits. Additionally it is sometimes used during certain phases of sur (smoke offerings for the dead), where again, one wishes to shield certain lower classes of invited guests form the yogis powerful gaze. 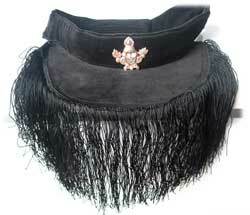 [T]he Dorje- Shamo (Vajra Hat) is particularly linked to the Chod tradition through the Third Karmapa. The most important early codifier of the Chod tradition, his collection of texts, the Rinpoche Tsogley Trengwa or Precious Rosary, have been fully assimilated by all Nyingma Chod traditions. 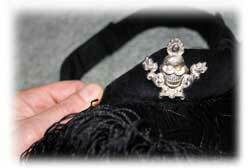 Thus his hat is also in widespread use by virtually all Nyingtig and other Nyingmapa chopas. It is made of brocade silk, with a two color pattern, somewhat similar to the common practice hat worn by Kagyu and Nyingma lamas in general. But it is distinguished by having no flaps, but instead a stiff lower collar in a lotus pattern. It is thus somewhat similar to the Rechungpa hat, with its fur collar, a hat that is also traditionally shown on the head of Tonyon Samdrup, MaChik’s son. Usually the upper and lower sections are dark blue with red trim, as illustrated here. For a less-wrathful approach, the reverse colors can be used. 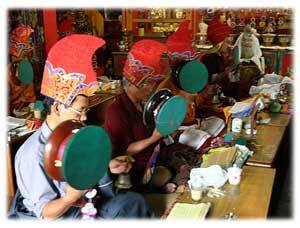 Dudjom practitioners of the Troma cycle wear a similar-shaped hat, the crow (karak) shamo, with its characteristic upper bird shape. This is also seen in various other wrathful rituals, such as Zor, for averting negative conditions.